Based on Marcus Pfister's popular picture book The Rainbow Fish, children can have so much fun reading and performing this readers theatre. The whole class can be involved, as there is no limit to the number of 'fish' characters. Children can make two-sided puppets on a stick to match their characters. 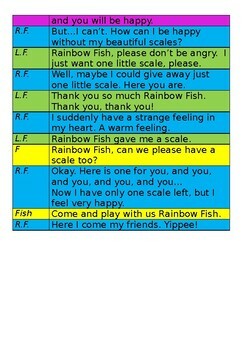 The fish puppets can be turned around to show the shiny scale when the Rainbow Fish starts to share his scales. 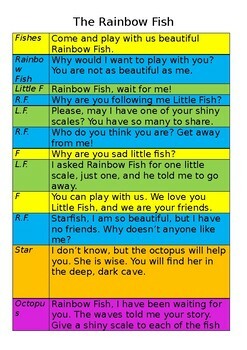 This story is a great resource when teaching social skills and the concept and value of friendship.